I cook a lot of stews, like this skinny sweet potato and bean chili, over the colder months. I love dishes that are rich, hearty, and piping hot when it’s cold outside. But that’s not the only reason why I cook them often. It’s also because I can reheat and enjoy them again and again. Luckily, stews reheat wonderfully and taste even better the second (or third) time around when the flavors have had a chance to percolate and meld together over a longer period of time. To be honest, that’s the main reason I make this skinny sweet potato and bean chili. It’s delicious from the get-go, but it’s even better reheated. 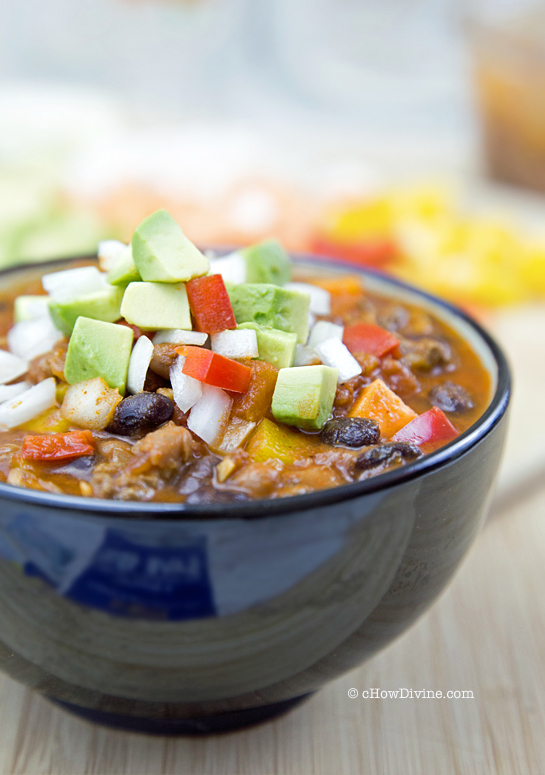 Aside from the yummy leftovers, I love this sweet potato and bean chili because of it’s spicy and subtly sweet flavor. Maybe it’s because many of the Korean dishes I grew up on were a combination of spicy and sweet. This flavor combination is so familiar to my palate and, thus, so comforting. To add even more to the familiarity, I make this with a little bit of gochujang. I do this often with stews and sauces. It’s an easy way to add an extra layer of flavor. Just replace part or all of the tomato paste with gochujang. The flavor is simply amazing. Heat a dutch oven or heavy bottomed pot over medium-high heat. Add enough oil to cover the bottom of the pot. Add ground beef or turkey to the pot. Add a pinch of salt and ground pepper. Stir until the beef/turkey is lightly browned. Transfer to a plate. Add the onions, bell peppers, garlic, and sweet potatoes to the pot. Saute for about 3 minutes until the onions begin to soften. Add chili powder, cumin, oregano, and cayenne. Stir until the spices begin to stick to the pan. Add back the beef and mix well. Add water to de-glaze the pot. Add tomatoes, salt, tomato paste, and gochujang (if using). Stir to mix well. Turn up the heat until the contents come to a boil. Turn down the heat to simmer and simmer for about 30-35 minutes. Add the beans to the pot and mix. Turn up the heat until the contents come to a boil again. Turn down the heat to low and simmer for at least 20 minutes for the flavors to come together. Salt to taste if necessary. Remove from heat and top with diced avocados and onion. Serve over rice, quinoa, or pasta. 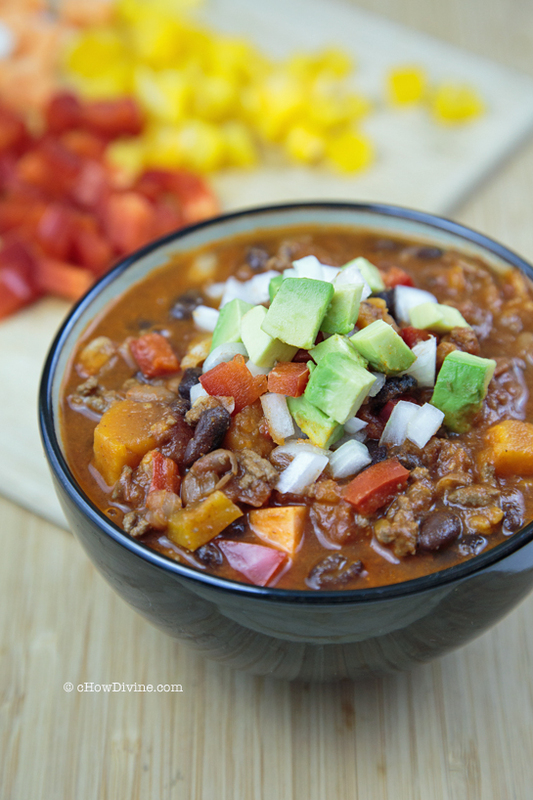 For this healthy sweet potato and bean chili recipe, I used Simply Organic chili powder. If you want to make this gluten-free, make sure to read the label to ensure that there are no gluten-containing ingredients. Many brands use anti-caking agents that include wheat or gluten-containing ingredients. If you want to make this chili gluten-free or don’t have any gochujang on hand, just replace it with additional tomato paste. So if you aren’t using gochujang, you will use 2 TB of tomato paste instead of 1 TB. Don’t forget to top with diced avocados and onion. They really add to the flavor. Any onion will do. Just dice and give it a rinse under cold water. It will taste “cleaner” that way. This dish tastes better the next day after it’s had a chance to sit in the refrigerator overnight. Just reheat it with a little splash of water. The flavors come together wonderfully. I love sweet potatoes in chili! They really add a lot of depth of flavor. This looks wonderful — thanks. I eat a lot of sweet potatoes all throughout the year. I love them and incorporate them in so many dishes. They do add a lot of flavor! Thanks John!! 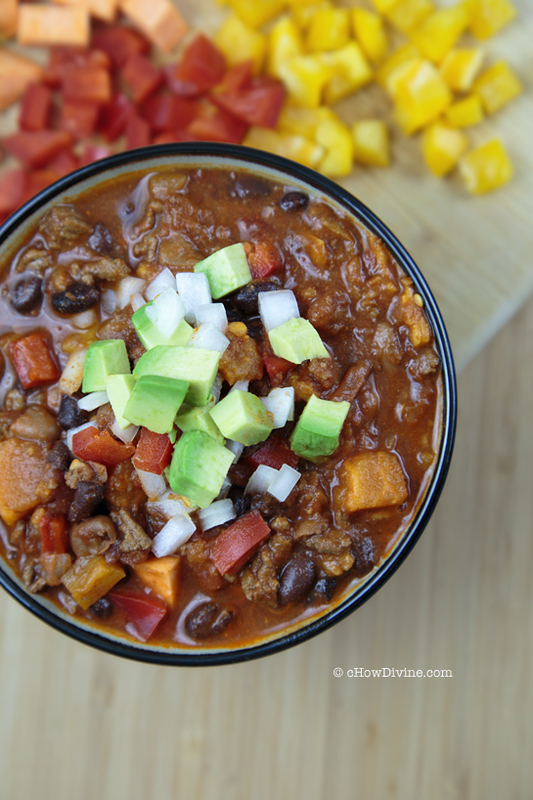 I love to pile black beans on top of a baked sweet potato so I know that we would love this chili! I’ve never used gochujang but I keep seeing it and now am very curious to try it. Thanks for a great winter warm up dish! This really looks comforting, Gomo! You are so right about these dishes, it’s better with the time…Yummy pics as always! Love these dishes in the winter time. They feel like a warm blanket for my stomach in the winter. :) Thanks Sandra! Love chili. I’ve never tried gochujang in chili before though. That’s very interesting! I gotta try that some time. I wonder what else you have added gochujang (other than Korean dishes) to.